Like a number of pop shields on the market today, the Stedman Proscreen 101 uses metal grille, as opposed to nylon mesh. Metal pop shields are easier to clean and generally more hard-wearing, and while some nylon-mesh screens can tend to take the edge off the vocal by subtly reducing the high frequencies, metal pop shields are less likely to affect the sound. 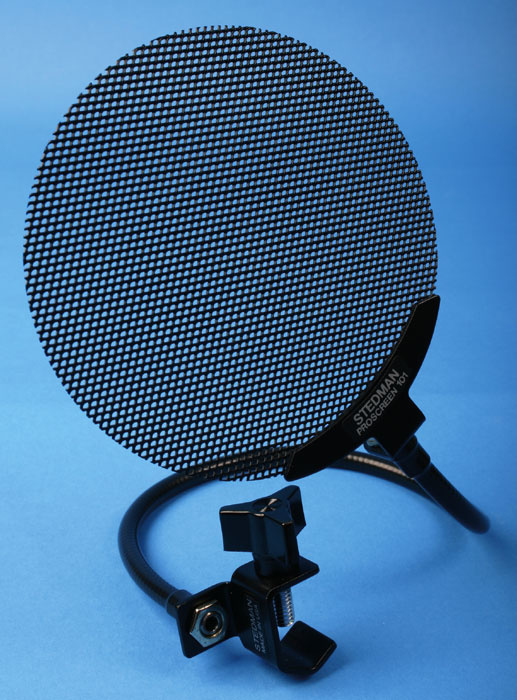 The holes in a metal grille are much bigger than in a nylon mesh, but are spaced in such a way as to successfully diffuse any plosives and air blasts. The Proscreen 101's grille is around 4.75 inches in diameter. This might seem a little small, but since pop shields must be placed at least a couple of inches away from the mic to be effective, it's plenty big enough to cope. The grille isn't bound around its edge, which is consequently a bit rough and jagged, but this has no effect on the pop shield in use. Stedman also produce the pricier PSXL, which has a bound, six-inch-diameter grille, if either of these things are a concern to you. The 13-inch gooseneck attaches to the mic stand using a screw clamp. It's flexible enough to get the screen where you want it and strong enough to hold it in place. Goosenecks can sag with age, but since the Proscreen's grille weighs very little this shouldn't be too much of a problem. Stedman provide a lifetime guarantee in any case, and the Proscreen feels solidly built. One tiny issue is that the screw clamp doesn't have a rubber stopper on it — the bare end of the flat screw comes directly into contact with the mic stand. This does mean that the clamp tightens very securely, but if you're worried about scratching up your mic stands you may want to put a bit of card in between. (You should also probably get out more!) In use, I found that the Proscreen 101 did an excellent job of stopping plosives while having next to no effect on the vocal sound. No audible effect on high frequencies. Fixing the stand clamp securely may mark your mic stand. A robust alternative to nylon-mesh screens which has a negligible effect on the recorded vocal sound.